A lovely, vintage inspired apron - perfect for St. Valentine's Day! If you didn't get the chance to visit Between U & Me yesterday when I was guest posting, here is the project for our wonderful One Yard Wednesday. We will be using a pillowcase and about a yard of gingham. Feel free to mix and match fabrics as you choose to either coordinate or match your pillowcase, or what's available in your stash. No pillowcase? You can find out how to make one here, and use your stash or other repurposed fabric to make one. As soon as I saw it, I knew I had to try to make that apron for myself. So just like all my other projects, I had to mentally pull apart the pieces to decide what made this apron so special. Well, of course, the obvious attraction is that cross-stitching, which I'm sure was done by hand. What a great way to accent that beautiful green gingham! And I also liked how it was fitted, like a pencil skirt, instead of either just flat across the waist or gathered. That makes it seem so classy and elegant, instead of so "everyday" - don't you think?! In addition to the pillowcase and gingham fabric, you will need thread that matches your pillowcase (mine was white), and thread that coordinates with your gingham or contrasting/coordinating fabric (mine was red). You will also need a rotary cutter, ruler and mat, and a sewing machine, and you need to know how to use them (and safely!). Have your iron and ironing board handy, too. Oh, and pins would be pretty useful. Well, actually necessary this time. Remove the sewn end of your pillowcase. Save the hem pieces for later - you'll see why in a little bit. Next, we're going to trim it to a size that will fit across the front of your body and about halfway around the sides. Like to where the seams are for your jeans. I wanted the apron to cover the front of me, from just below my natural waist (because we'll be using a good-sized waistband), to just above my knee, leaving room for a nice-sized gingham hem. Also, because my pillowcase was a pretty sheer white, I wanted it to be doubled. This would give the apron a stability boost, too. For me, this measurement was 33" by 25 1/2". If you need to change measurements to fit you, feel free. It's an apron. This is good practice for newer sewists. You may want to ask a friend or neighbor to help you meaure, or if you have to do it by yourself, lay your favorite pair of pants on the floor and measure on them. Remember, our end product is going to be straight and fitted like the front part of a pencil skirt. And it's an apron. An extra half inch (or short a half inch) is not the end of the world. Running out of chocolate is. 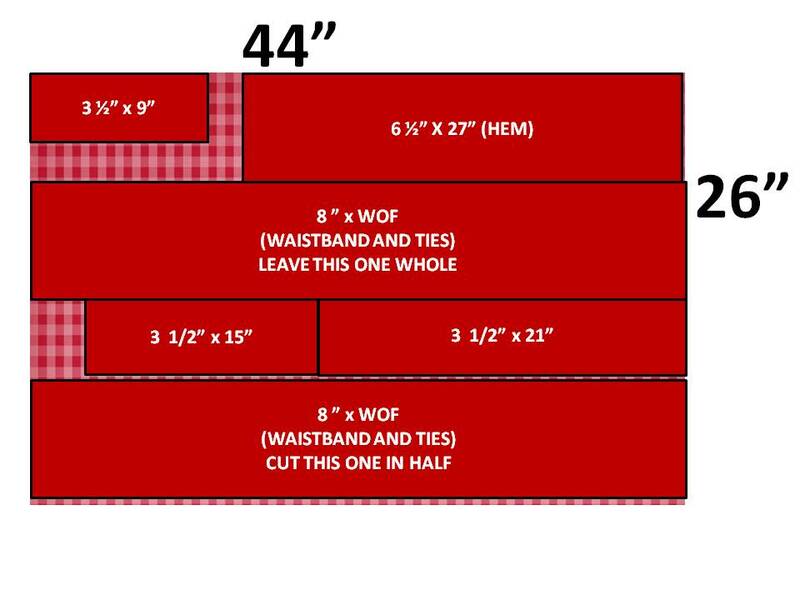 Now, cut your gingham pieces per the diagram. Here you can see how I cut the different widths and labeled everything so my poor over-40 brain could keep them straight. Now, it's time to start pressing. Let's begin with the hem. Fold it in half, wrong sides (the inside or back) together, and press. Match the raw (unpressed) edges to the bottom edge of your main apron fabric. Stitch together using a 1/4" seam. Press the seam toward the gingham. Next step is making a rolled hem on the side edges of the apron. Press under 1/4". Then, fold over and press again. Stitch these side hems in place - just a straight stitch is fine. I didn't even do the forward-back-forward reinforcing. Try to stitch in the center of the hem. I also stitched on the right (front) side. This is where we start building that pyramid shape. Or birthday/wedding cake if you prefer. On the remaining gingham rectangles that are 3 1/2" wide, press each edge under 1/4". Top stitch these into place after pressing. I used my white thread to do this, so the stitching would blend into the gingham better. On your apron, you decide which thread to use. Take the longest of these rectangles, and press it in half. Fold the main body of your apron in half, and match the centers, and also try to match the lines of the plaid. If your rectangle goes one way or the other just a little, it's ok. People will notice that less than the plaid going zigzag. Think handcrafted versus homemade. Yeah, it's one of those crazy little details. You'll be thankful in the end - trust me! Pin around all 4 edges. Once it's pinned, topstitch into place. Again, thread color is your choice. Repeat with all 3 rectangles. Here's the finished pyramid/celebratory cake. Starting to look like the picture, huh?! For the waistband, take the 8" rectangle that stayed whole, and press one long edge under 1/2" toward the wrong (inside/back) side. When we attach the waistband to the apron, this will be on the inside, and make a nice, finished edge. Fold the waistband in half, with the right (outside/front) sides together. Stitch both short edges, and use a 1/2" seam allowance. Clip the folded edge corner (just close to the seam but not through it), and trim the extra fabric from the seam. Turn and press. Like this. Before we attach the waistband, we need to add the darts, which is our new sewing skill of the week. "What is a dart?" you ask. That is an excellent question. A dart is a glorified long triangle that takes something flat and square, and allows it to curve in all the right places. If you look at the back of your favorite pair of dress pants, you will probably see a dart. It probably starts at the waistband and works its way south. This allows something flat and square (the plain old pant leg) to curve to cover your backside. We want our apron to curve in the front, so the darts will go in the front. Here is a close-up of the pinned dart. Sorry, it's a little blurry, but I think you can get the idea. And here is how we make it. Fold one side edge of the apron to the center, with the right (front) sides facing. On this folded edge, measure down 3" from the top and mark it with a pin (in the photo above, it's the red one). From this folded edge, measure in 1/2" and mark with a pin (the gold one). Before we start the next step, just take a deep breath and relax. Aaaaaah - doesn't that feel better? Making darts makes some people really nervous. I don't want you to be nervous. Embrace your new skill, because here we go! You are going to stitch, in a generally straight line, from your top pin to your bottom pin. If you want to mark lightly with a pencil or some tailor's chalk or a special marking pen before you stitch, that's ok. Maybe use more than 2 pins. Whatever will help you get from Pin A to Pin B successfully. When you are done stitching, press the dart on the wrong (back) side toward the side edge. The front will now look like this. Repeat for the dart on the other side. If you need/want smaller or larger darts, or you don't want darts at all, feel free to adjust as necessary. Let's attach the waistband now - the baby will be awake soon, or the kids will be home from school any minute! Match the long unfolded edge of the main waistband piece to the top edge of your apron, matching the centers. The waistband will hang off the edge on the sides, and that's ok.
Stitch together, using a 1/2" seam allowance, and press the seam fabric up toward the waistband. This is also when you press that bottom edge up (where it's not attached to the apron) 1/2". It's not tricky, just watch your fingers with the iron. Fold the already-pressed edge over the top of your seam, and match your waistband edges. Pin, and use as many pins as you need to keep your edges straight and cover that inside seam. Topstitch all 4 edges. Here you can see the back side of the waistband, all stitched into place. To add the ties, take the remaining two rectangles, and press under all 4 edges 1/2" toward the center of the wrong (inside) side. Fold in half, with the wrong sides together, and long edges matching. Pin as needed, and topstitch all 4 sides. Now, my ties are smaller (cutting error - my bad! ), so you'll have to pretend a bit. Overlap the short edges of your ties with the main waistband about 1-2". You can adjust for the length you want your ties to be. Plus, remember you have to match the lines of the plaid if you are using gingham. Stitch a box, going around all 4 sides of the overlapping rectangle area. If you want that cool stitched effect, you can play with the decorative stitches on your sewing machine. Even super basic models of machines usually have some type of zig zag, and I haven't seen a model made after 1970 that didn't come with some type of buttonhole stitch (which is also just a really tight zig zag). My machine has 3 different cross-stitches, so I decided to try the 2 I use the most to get a general idea of how they'd look. This is where you put your scrap "main body" fabric and a piece of "accent" fabric together, and you play with thread. Use a color that you need to use up, or you had to buy for one project and you'll never use again. Save the good stuff for your apron. I liked the alternating crosses for the edges, and straight-row crosses the insides. It seemed to mimic the original in a way I liked. Choose stitches that you really like for your apron. Here is a close-up of the finished stitching on the body of the apron. I used the straight-line stitching across the areas where the rectangles met, and also around all 4 edges of each waistband piece. Stitch where it makes you happy. Dig out those pillowcases that are long since past their prime and put them to good use. Cover stains or wear spots with accent fabric and stitching, and turn something that's "eh" into a "WOW!" What a fantastic tutorial! I have a love for aprons, and I love this one!! Thanks for linking up at WIP'D, I really appreciate your addition to the linky this month, such an encouragement. Perhaps I will see you again this month, and the months to come! Bless you! This is such a cute apron and looks easy to make I love it, and your blog. I love it too Ann. I love the little red n white gingham. Reminds me of childhood. I know that dates me. LOL. Wow, what a wonderful tutorial again. Thank you so much. There are so many new sewers out there that this will really be helpful to. This is such a great tutorial! Love the apron! So nice stopping by to visit with you! Super cute apron, I like the gingham -gives it a vintage look. Thanks for linking up to Eat, Grow, Sew - glad to have you along! I love aprons! What a great tut. FOund you on A Round Tuit. Cute apron and a lovely tutorial too! A great tutorial and a beautiful end result! I'm always so impressed by people who can create beautiful things--well done! I Love step by step directions! (especially with sewing!) And Thanks for linking up to Six Sister's Stuff! Hope to see you back next Saturday! Gosh, I love to sew, and you just gave me another project to look forward too. You really provided a great tutorial. Thanks! Thanks for sharing your creative inspiration at Sunday's Best Par.tay! Gingham brings back positive memories of sewing cross-stitch at school. Thanks for sharing such a comprehensive tutorial and a great way to recycle. I love the book A is for Apron I just made the skirt apron in there. Such a great book. Great fabric use! Thanks for linking up to I Made It! Monday. Can't wait to see what you have this next week. great tutorial! thanks so much for sharing on craft Schooling Sunday! I love aprons and this one takes the cake for easy materials and looks! Thanks for a great tut!